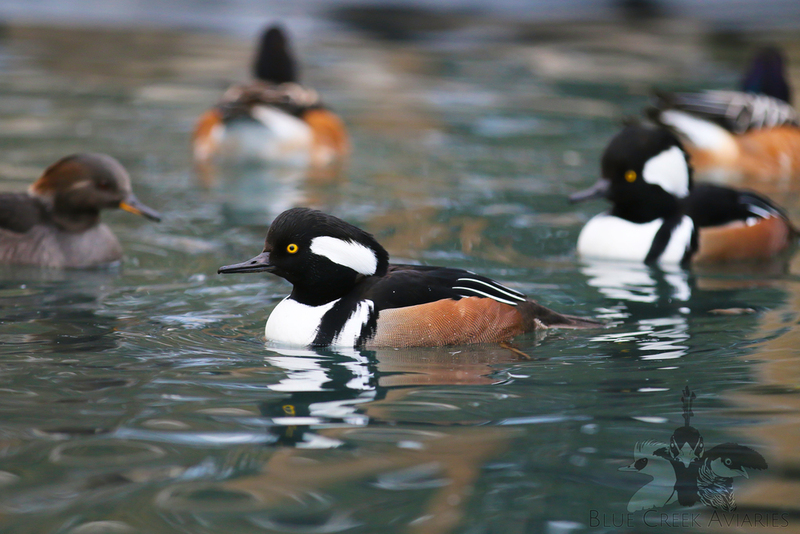 Many of the ducks kept at Blue Creek Aviaries are protected by the Migratory Bird Treaty Act, and therefore require a Waterfowl Sale and Disposal Permit to be able to keep, breed, and sell the listed species. The link for the application form for the federal license is: http://www.fws.gov/forms/3-200-9.pdf. Below is a list of the species that we raise that require a permit, but for the entire list, visit: http://www.fws.gov/birds/management/managed-species/migratory-bird-treaty-act-protected-species.php. Our young birds are close-banded to meet the requirements of the FWS. If you intend to buy a licensed species then you will have 30 days to apply for a federal permit. Keep in mind that each state also has its own requirements. For fellow New Yorkers, you will have to select one of the two licenses (keep in mind that you cannot sell if you do not obtain the Class A license): http://www.dec.ny.gov/permits/25010.html. 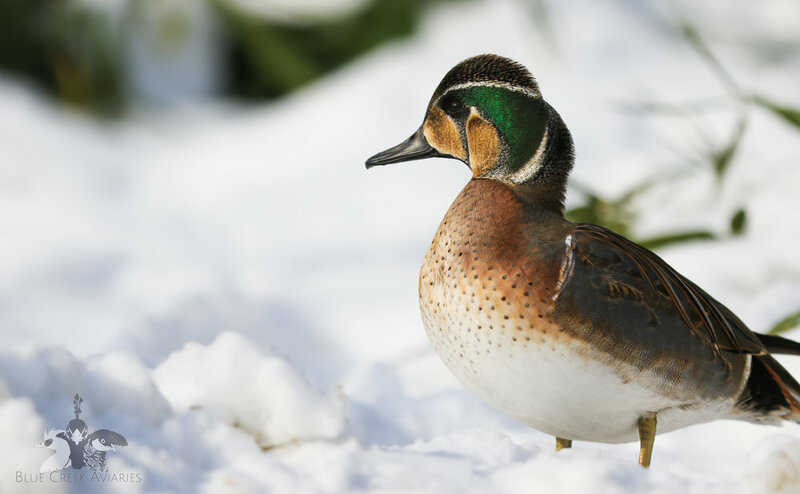 All shipments of licensed ducks will come with Form 3-186. Three copies will be sent out, and I will require two filled-out copies to be sent back to me. Each year I have surplus species available for sale. All of the offspring I raise are seamless banded and full-winged. If you are interested in any species, I recommend you contact me through the form below to be placed on my waiting list. I will be screening buyers to make sure my birds are going to suitable homes. I put lots of time and resources into raising quality young so that others can enjoy these fabulous species as much as I do. If you would like a shipping quote please include this. Thank you for your inquiry. I will try to get back to you as soon as I can! At Blue Creek Aviaries, the main method of shipping live birds is USPS Priority Mail Express. I only ship on Mondays and Tuesdays, just to avoid the possibility of birds being stuck in the Post Office over the weekend. Boxes always include a layer of straw/hay, a handful of feed, slices of fruit, and some greens. Once birds leave my hands, I have no control over what happens until their delivery. Mishaps can occur, so that is why I encourage extra insurance to be added to shipments that are valued over $100 (for Express mail there is $100 of insurance already included). For the majority of orders, a standard sized shipping box (referred to as a two-bird box) is used. This will comfortably hold a pair of ducks or one pheasant. The box charge for the standard box is $10. For larger orders, one of the larger box options is required. Since I usually only have a steady supply to two-bird boxes, it is often easiest to have the customer purchase one of the larger boxes (based on my recommendation), and have it shipped to me so that I can ship out the order once I have the box. The majority of peafowl shipments will require the largest live bird shipping box, the Swan NEST. If you happen to have a used one and wish to reuse it, I am willing to do so. Otherwise, I will let the customer know where they can obtain the appropriate box and have it shipped to me. The majority of shipping at Blue Creek Aviaries occurs in the fall. By this time the offspring can be sexed and it is cool enough to ship. I do ship all other times of the year except during the summer. Keep in mind that pickup is always an option that I am welcome to; it is a less stressful and quicker option. If your shipping zip codes start with any of these three digits - that means there is a USPS embargo on shipping live animals to your zip. We will have to ship to an alternative zip code. USPS embargoed zip codes begin with 044, 046, 148, 149, 307, 356-58, 373, 374, 466, 496, 544, 548, 556-558, 564, 590-593, 596-599, 620, 622-624, 628-634, 636-639, 648, 650-658, 716-722, 725-729, 740, 741, 743-749, and 821. Since I have had live bird shipments returned due to a USPS embargo, I will be using this list to determine whether I will be able to ship to your zip code or not. Please take time to review the list. My customers in embargoed zip code regions have managed to get birds shipped to them by using another Post Office (with a zip code not listed above) with the Hold for Pickup option. Contact me to arrange something if you would like to still purchase something and have an embargoed zip code. Thanks for understanding. If you would prefer airline shipping, which would be most beneficial for the diving duck species, please contact me to arrange something.